Find the real speed of your card. Get information on card speed, class type (class 10, UHS-I, V90), flash memory type (eMMC, UFS) or check fake or damaged cards. 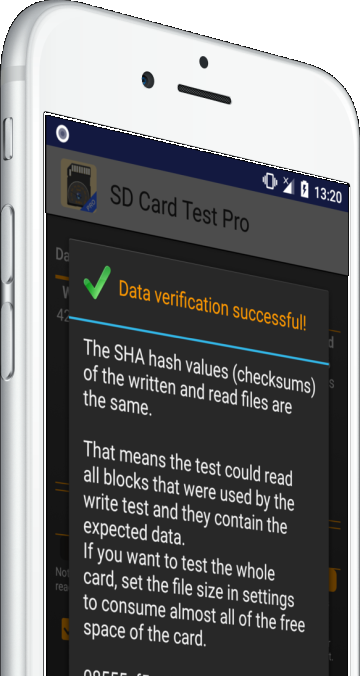 Discover the useful features provided by SD Card Test. Test any type of SD cards, including Micro SD, SDHC and SDXC cards. Detect eMMC, UFS 2.0 and 2.1 or higher for internal cards, detect class type (class 10, UHS-I, V90) for external cards. Confirm that your card is not damaged, and it is not fake (not labeled higher than it is in fact). It supports several file systems, like ext4, exFAT or FAT/FAT32 (VFAT). Our mission is to help you to find the real speed of the card, even if it is built-in storage or external card. Based on the speed, our app will classify your card. As you probably know, there are a lot of fake SD card on the market, and even if it is a genuine card, the speed is highlighted as “up to”. That can mean anything. 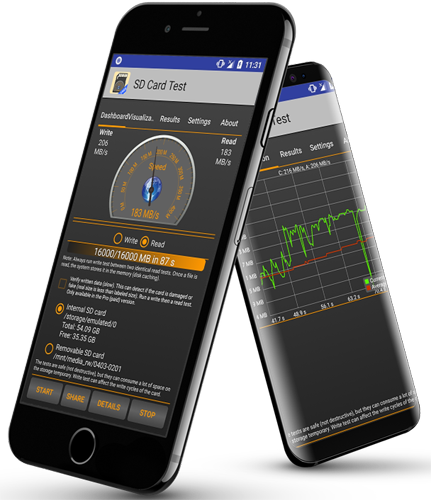 With our SD Card Test app, you can measure the real speed, including reading and writing speeds. You can test your card with different combinations. What’s more important, using the data verification technology (available in Pro), you can confirm that your card is not damaged, and it is not fake (not labeled higher than it is in fact). © 2019 SD Card Test. App Landing Page By Rara Theme. Powered by WordPress.